Monday-Friday from noon to 1:00 PM. We are located in the Medical Dental Building in downtown Seattle. Our building is next door to the flagship Nordstrom and between Pacific Place Mall and Westlake Mall. If you work downtown, reaching us is easy any day of the week. If you mainly shop downtown, consider a “doc-and-shop” trip along with your next appointment! Parking and public transportation options abound in the vicinity of our building. One of the nicest and most accessible is the Pacific Place Mall garage, with an entrance on the other side of 6th Avenue, just before Olive Way. We are across the street from the Westlake stop for the Metro Bus Tunnel and Central Link light rail terminal. We are also across the street from the terminus of the Seattle Streetcar and the Monorail. In addition, dozens of bus lines stop around our building. 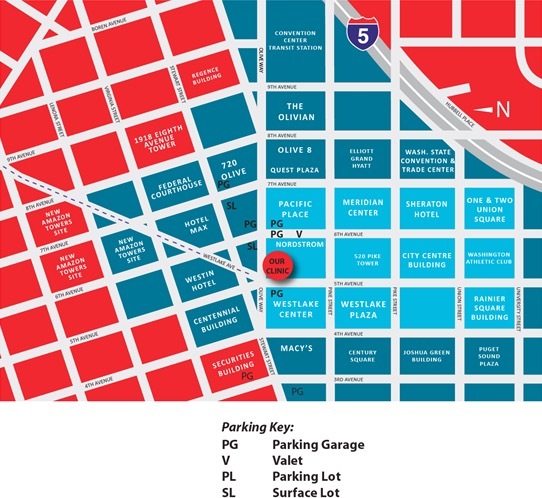 The map below show nearby landmarks and parking options.